Turn sand dollar seashells into beautiful Christmas ornaments by painting on a poinsettia design that takes advantage of the shell’s natural lines. This is such an easy craft, yet it looks lovely as a Christmas tree trim. Turn the sand dollar to the flat side and you will see and feel the outline of the poinsettia – trace these lines with a pencil. Study the photo above for details. Paint inside the lines with traditional red, or any color of your choice – poinsettias are available in the stores now in golds and pinks, which look equally luxurious. For the center, dab some circles with two shades of brown. Go back with some black paint and outline the lines. Date the back (which is the front of the shell) and put on a gloss or matte sealer. Lastly, string some pretty color ribbon through the hole and add a little bow at the top. On the bigger sand dollar I put on some snow paint, but this is optional. You could also add a little glitter. – When I bought the sand dollars, the smaller one was broken in the center but thankfully the doves were in the package. I glued the doves to the side of the finished sand dollar although this is not visible in the picture. 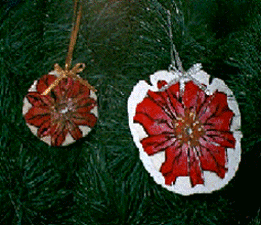 – Try decorating your sand dollar with small Christmas pictures, then sealing for a decoupage effect. If you are making these ornaments to give as gifts, you might like to include this free printable version of the “Legend of the sand Dollar” , shown at right.